We had to wait 3 hours to check in. Some hotel staff were downright rude. The room was fine but it looked like it hadn’t been vacuumed. Considering it is a Marriott, disapp. Nice & friendly was glad I stayed there as I return home on a vacation. Booked a king with sofa, first room given was a double twin- no sofa. Went down, asked for another room, was given a queen with sofa. (I have a king at home. I know what size it should be.) Didn’t want to go down again. Stayed with the room. It smelled weird, some scents are trapped in weird corners. Besides initial person who checked me in, staff were pleasant and nice. I left a lot of books for some bibliophiles which I hope they enjoy. I always stay at this hotel on Julia street when I visit family in New Orleans. Great location. You avoid the craziness of Canal street. The run a tight ship here. All of the hotel staff is pleasant and address your needs. Great Thank you to the staff on Monday night, 05/21/2018, who shut down, quickly, the drunken party that set up and preceded to be as LOUD as they could. I waited till midnight but these folks wanted to bring the French quarter inside. THANK YOU!!!!!!!!!!!!!!! I got some needed rest and enjoyed the rest of my stay. all was good, that's what I have come to expect from Coutyard! Orbitz was unclear about breakfast policy when the booking was made. It stated breakfast available and then when we got the email that breakfast was available for 2 although room was booked for 3 adults. We called customer service regarding this but their response was very poor. The customer service supervisor said she would send us an email so we could get reimbursed for breakfast but she never did. Secondly, Hotel stay was disappointing, water heater did not work properly, we had to have lukewarm showers in cold weather. Room was not cleaned properly when we came back in the evening, one bed was not made. Breakfast was not so good either and service was extremely slow. The only plus was that the hotel staff / operator was very nice. Wonderful location and friendly staff made our stay fantastic! Staff was very attentive. I really liked that my car was parked at the hotel and not some random lot 2 blocks away. I needed my umbrella from the car and valet went and got it for me within a minute. Room was very clean and very quiet at night. Will definitely stay here again. I really enjoyed my experience at this hotel. It had nice people. The room was lovely. When I had a problem, they came right up and fixed the issue. I was comfortable and happy for my stay. Nice hotel in good location in Warehouse district. Hotel staff were very friendly and helpful everyday. Room was nice and clean with no issues noted. My one complaint was the bistro for breakfast. We expected a buffet or something like that. We stood in line and took almost one full hour to get coffee and breakfast sandwich. Admittedly it was toward the end of the breakfast hour, but it was more of an event rather than just breakfast. I suggest you go early to avoid the crowds. Other than that, I absolutely would recommend staying there. 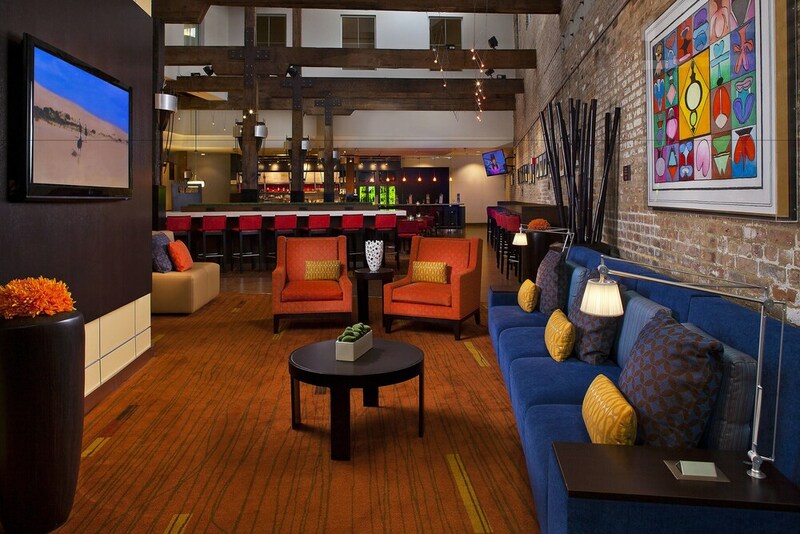 The hotel décor fit in nicely with other buildings in the warehouse district. Definitely one of the more uniquely designed hotels I've seen. There were many restaurants and businesses nearby. The prices are competitive and the amenities are way above average. Beds so comfortable, staff nice. Great restaurants close by. We had a nice room with a balcony overlooking the pool. I was able to sit and read. We walked to French Quarter, the Riverwalk and Bourbon Street. Located in Central Business District, Courtyard by Marriott New Orleans Downtown/Convention Center is adjacent to Julia Street Cruise Terminal and within a 10-minute walk of other popular attractions like National World War II Museum. This 202-room, 3-star hotel welcomes guests with a restaurant, an outdoor pool, and free in-room WiFi. This hotel is home to a bistro and a bar/lounge. You can sip a beverage at the coffee shop/café. Start your day off with buffet breakfast, available for a fee. Guests can expect to find free WiFi and 26-inch a flat-screen TV with cable channels and pay movies. The bathroom offers hair dryers and free toiletries. Other standard amenities include a refrigerator, a coffee maker, and free weekday newspapers. Guests staying at Courtyard by Marriott New Orleans Downtown/Convention Center enjoy an outdoor pool, a fitness center, and a spa tub. Valet parking is offered for USD 39.55 per night. The 24-hour front desk has staff standing by to help with dry cleaning/laundry and securing valuables. Additional amenities include free WiFi in public areas, a 24-hour business center, and a computer station. The Bistro - Restaurant and bar specializing in American cuisine and serving breakfast and dinner. Kid's menu available. The front desk is open 24 hours a day, and checking in and out are easy with express services. Driving? For a fee, this property offers valet parking, along with extended parking.